The name is Chihaya, most call me Chi, and my husband and I are new to gardening. We purchased our first home in winter of 2015 and during the summer of 2016 we decided to do something about the 'garden' in front of the house. It was set up by the previous owner and was basically in the drainage ditch. It was mostly chives (which we successfully transplated out back where we grew a bunch of herbs and some pumpkin for the first time). We wanted to do something to make the drainage ditch more useful and opted to create a large raised flowerbed. We did research, bought stone, gravel, dirt, a circular saw, shovels, gardening fabric (to go between the wall and dirt), the whole nine yards. We ended up with 120ft total at around 3ft 8 inches (it's a bit shorter at the front because our property slopes downward so we made it wrap a bit and installed the drainage so everything will go downhill. It came out really well considering we have no masonry skills. But now we have a new challenge, what do we put in it? Oh, we did make a video chronicalling the creation of the garden (since our family/friends couldn't understand what we were doing). If it helps, this is the link below. I'm really hoping everyone can give us advice/recommendations. Last edited by webmaster on Thu Feb 16, 2017 3:39 pm, edited 1 time in total. Reason: Added the youtube code so that members can watch the video here without having to click away to YouTube. First off, that is a quite impressive project, my hats off to you and your hubby!! I would put in a butterfly house and around that put in some milkweed, like common milkweed and Cinderella Swamp Milkweed, the monarchs will love you for it. Wish I had a better picture of the Butterfly house. oh, never heard of a butterfly house, will definetly look into that It gets full sun, it's positioned south-east and has sun until it starts to set and drop behind the mountains. Does milkweed flower at all (total noob to gardening)? We really want to add color up there (from researching looks like annuals are the brightest flowers). You didn't tell us where you are. There are hardly any garden questions that can be discussed without regard to location/ climate. Yes, milkweed, aka butterfly weed, aka asclepias flowers. but you can also find it in red, yellow, and white. rainbowgardener wrote: You didn't tell us where you are. There are hardly any garden questions that can be discussed without regard to location/ climate. She did mention in her post she's from New York. I'm assuming the state since the attached pic seems to be a bit rural and not inner city. Edited to add this: I second rainbowgardener's advice about milkweed. I have some of it planted next to one of my trellises in my back garden and they attract huge amounts of butterflies every year and it is not unusual to see them flitting in and around my entire garden daily. OK sorry I missed it. 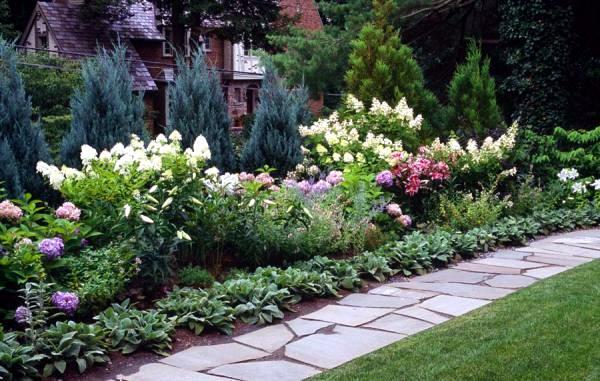 Still New York state does encompass everything from zone 7 at Long Island to zone 3 in the mountains which is a huge climate difference and would require very different plantings. Sorry about that, Owego, NY here According to the USDA Plant Hardiness Zone map I'm in Zone 5b : -15 to -10 (F). Also, that is a beautiful flower. We really want color, annuals and perennials. But we aren't sure how to group them. We don't want to just throw a bunch of plant out there. We want some sort of order to them, a pattern I guess. Chihaya wrote: Sorry about that, Owego, NY here According to the USDA Plant Hardiness Zone map I'm in Zone 5b : -15 to -10 (F). Like I mentioned, I too have milkweed but there are some issues with it that make it less than ideal for wide open spaces. It does grow fairly tall and mine always gets in the 5-6 ft. range at its peak and the stems stay pretty much the same size from top to bottom(about the size of a wood pencil). That makes the plants stems want to lean and sometimes fall over if grown out in the open, especially after heavy rains or winds. Mine is near a trellis that I use for climbing vegetables and I use some garden twine to tie it up to so this doesn't happen. It will spread on its own, so in a couple years time, 1 plant becomes many. What started out in an area about the size of a small bucket is now the size of a bathtub with shoots coming out of the ground. Great project, but I can see why the drainage ditch existed. You are below the road and as long as you have left the grade to the house uphill and there is enough of a grade to handle the 100 year flood. I think what you have would make a good rain garden. Plants for rain gardens have to be able to tolerate wet soils but be deep rooted enough so they won't get washed away in the deluge. Plants are zoned based on how much water they have to retain. Even though you have modified the ditch, it will still be the lowest end of the property and when it does collect a lot of water, the plants there will need to be able to tolerate that. Perennial native grasses, shrubs and flowers will need the least care and should be able to tolerate conditions when it gets very wet. 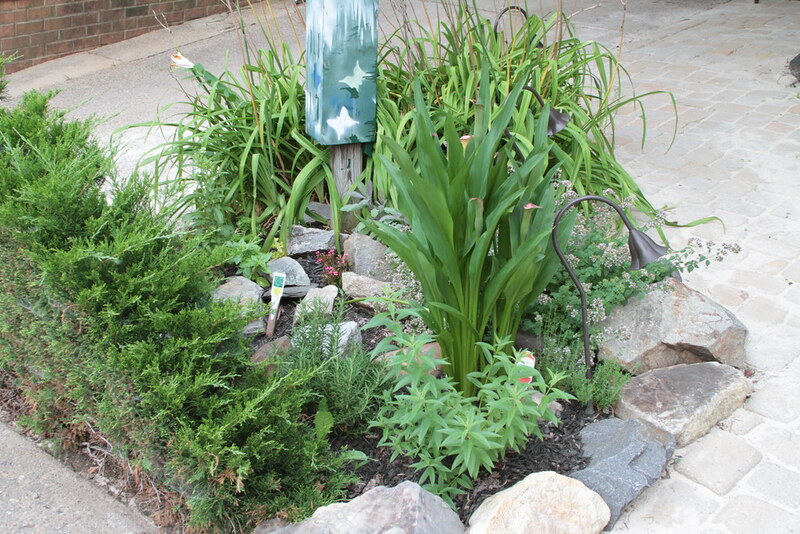 Rain gardens help to prevent runoff and improve the quality of streams nearby by holding back runoff water. This is a publication I found on New York natives that are good for rain gardens. I don't know most of these plants but it is a start. How wide is the bed? You are right to want some order to it, not for it to look too weedy. But you DON'T (unless you are very obsessive compulsive) want it all lined up like soldiers in rows. Things that will help keep it from being weedy: think about color scheme, one or two main colors and one or two accent colors (definitely no more than four total). Color schemes can be very bold if you pick contrasting colors like purple and yellow, red and white. 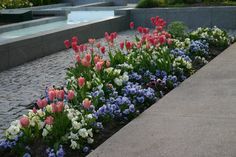 Or they can be very soothing if you pick complementary colors like purple and blue. All white is elegant and serene. Don't scatter colors all mixed up together, do them in masses, drifts. With such a long bed scattered colors will look messy and jarring. Put some height variations in. Taller things in the middle (of the width) sloping out to shorter things and some trailers that will drape over the wall. Maybe anchor it with some shrubs or small trees near the ends.